Snacking has, I believe, been portrayed unfairly as the villain in the debate about healthy eating. Low fat snacks can give us an energy boost, satisfy our hunger and be healthy without sabotaging our diets and weight loss plans. The problem is what we are snacking on and the quantities. Many snacks today are highly processed, loaded with fat, salt and sugar and contain few nutrients. They give us a quick fix then leave us feeling hungry again soon after with low energy levels. 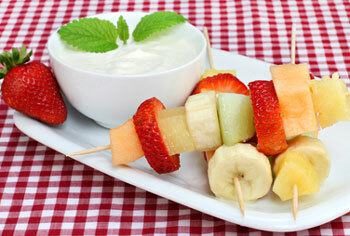 Healthy snacks have their place and make good sense for children, dieters and people with diabetes. Small children have small stomachs. Small amounts of food often make more sense than 3 large meals a day and mid-morning and after school snacking gives children a necessary energy boost. By eating smaller amounts of food, our stomachs shrink and become accustomed to feeling full with less food. If you are dieting, eating less more often will keep the hunger pangs at bay and provide you with more energy. Diabetics are able to keep their blood-glucose levels more steady with regular meals and snacks. Plus if you’ve ever had a case of the mid-afternoon blahs then you’ll know that a light afternoon snack can be a great pick-me-up that will get you through to dinner time. The problem is that we often reach for a quick fix such as potato crisps, chocolate, cookies, fries, pizza etc. We tend to reach for whatever is handy usually because we are busy and it is simply more convenient. 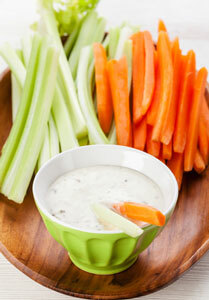 Most of us don’t have time to prepare elaborate snack foods. But with a little planning and forethought we can change this pattern. There are healthy snacks available that don’t take long to prepare. These easy snacks are portable, fit easily into lunch boxes, require very little or no preparation and many don’t need refrigeration. These snacks are still easy, but require some preparation. Many of these can be made in advance, in batches, then stored ready for use.